That moment when you realise you’ve just been a bit of a numpty and you’re wishing you could rewind for a couple of minutes? Yup. That was me as I faffed about just off the beach close to Hayling Island Sailing Club after I’d finished what had been a very satisfactory stand-up padleboard race. At least, I thought I’d finished. But I hadn’t. It had all been going so well. 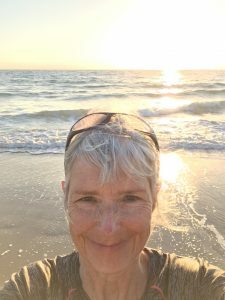 The sea was altogether playable — none of the absurd chop I’d had to navigate the last time I was at Hayling — and as we reached the halfway point of this nine-mile out-and-back race to Langstone Bridge, I was second woman and having a blast on my beautiful Starboard. Then I heard voices — distinctly female voices — behind me and about half way back to the finish, another woman drew alongside. We paddled side by side and then, closer in, another woman cruised alongside. The three of us were pretty much neck and neck until Woman A (Lorraine Grant in real life!) blocked me magnificently to get away and Woman B (Sadie Bedford) pulled a little bit ahead as well. Now I was in fourth place — but wait! Sadie just fell in. Great, I thought. All I have to do is get in front of her and I’m on the podium. Except I hadn’t been paying full attention at the — rather lengthy and not always audible — pre-race briefing. I’d assumed you passed a marker buoy and that was the race over. But no. You had to get out of the water and carry your board onto the beach to be classed as a finisher. So as I slowly ambled towards the shore thinking it was all done and dusted, Sadie — by now out of the water and back on her board — whizzed past me and snaffled the third woman’s place on the podium. But not all was lost: to my surprise, and despite my costly mistake, I came in eighth overall out of 24 finishers. Plus it was indeed a really enjoyable day out, though Bray Lake colleagues who completed the full 14-mile Hayling Island Challenge begged to differ. That was on 22 September, a week after my now annual appearance at the Lamlash Splash open water swim on Arran. This time I knew exactly where the finish line was and what I needed to do to cover the 1.3 miles from glorious Holy Isle (of which more in a future post) back to Lamlash. Or I thought I did. Calm before the storm, with Holy Isle — the Lamlash Splash start point — behind me. As this was my fourth sortie, I figured I had it pretty much sussed: I’d so far twice recorded 55 minutes, give or take, plus a slightly disappointing 58 minutes. So a time somewhere around the 55-minute mark seemed altogether doable. However, and as yet another sharp reminder not to take anything for granted where the sea is concerned, this crossing was a little different. As we were ferried to the start, I could see there was more chop than I’d experienced before here — not surprising, as the week running up to the swim had seen consistently strong winds — and the air temperature was lower. 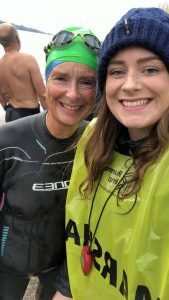 On their own, a bit of chop and a chill in the air aren’t usually an issue, and I wasn’t even particularly concerned when I got in the water and realised it had dropped a degree or so since the acclimatisation swim I’d done two days earlier. Besides, I was fully neoprened as this is a wetsuit-compulsory event and I’d added gloves and feet, mainly as jellyfish barriers. But what I hadn’t taken into account was the sum total of all that plus a turning tide. Why? Because it hadn’t been an issue in 2015, 2016, or 2017! This time, however, the combination of the wind, the turbulent water, the odd squally shower, and the tide meant I found myself doing that ‘Are we nearly there yet?’ thing for what felt like the longest time. At no point did I think I wouldn’t finish, though, and I was strong enough and proficient enough at sighting to maintain a pretty straight course. I was nonetheless exceedingly glad to stumble up the slipway at Lamlash and declare it ‘job done’. Then I looked at my watch, and… What?! That 1.3 miles took me 1 hour and 14 minutes, nearly 20 minutes longer than the year before. Just as I began beating myself up, my daughter Claire — who is now chief Lamlash Splash timekeeper! — firmly told me to stop. Everyone had been slower — the winner by just shy of 10 minutes — and two swimmers had been pulled so far north by the current that they needed rescuing. Oh, and the water temperature was around 12C — a tad different from the 20C+ of Bray Lake I’d come from! With that perspective, I was able to give myself a modest pat on the back instead. 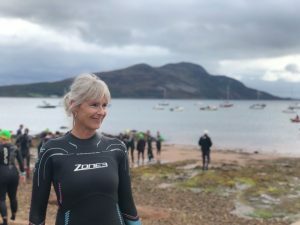 I’d already been aware of the SUP-swim synergy but competing against the pull of that Lamlash Bay tide revealed just how much stronger my shoulders and arms have become since I began paddling. I may not be any faster in the water — that’s down to my iffy technique — but there’s definitely more power in my stroke to stay on course and I can consequently keep going for longer. All of which just goes to show — yet again — that you really are never too old to surprise yourself, in this case by building new muscle and strength. For the first time in my life, for example, I now have visible biceps and this is ridiculously satisfying because no matter how fit I’ve been in the past, they’ve always stayed hidden. Not hidden under flab, but just not noticeable, irrespective of how long I’ve spent giving them my focus in the gym. 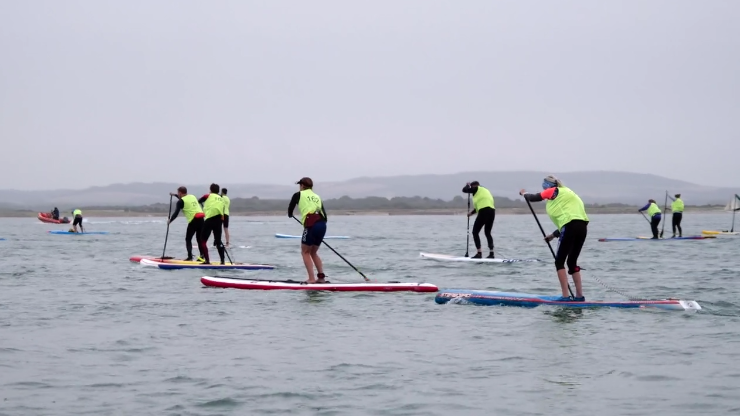 Meanwhile, next stop is the technical race for 12’6″ paddle boards — that means lots of buoy turns — at the British SUP Club Championships on 29 September where I’ll be aiming to get as many points as possible for host team Bray Lake. Main image: Near the start of the Hayling Island Challenge — I just did the nine-mile out-and-back race to Langstone Bridge. I’m on the right and looking a little weirdly hunched as I was wearing a buoyancy aid!